Starting on Sept. 6, the DPD will be targeting all school and playground zones to reward safe kids and remind drivers of 30km/h speed limit. Sample 'positive ticket' being handed our by Delta Police. To kick off the start of school year, the Delta Police Department is trying something new. For 10 days starting on Sept. 6, officers from the DPD’s traffic section will be targeting all school and playground zones in Delta to remind drivers that 30-kilometre-per-hour speed limits are in effect. However, officers won’t just be ticketing speeders and distracted drivers. 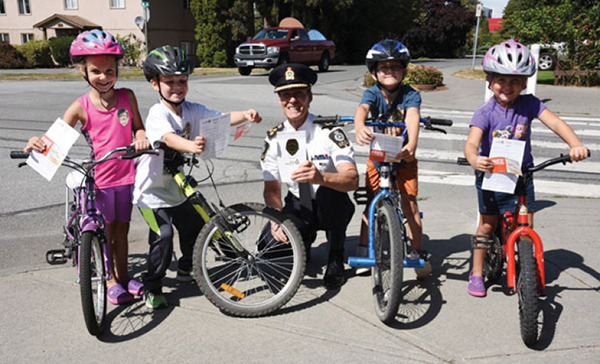 This year, they’ll be handing out “positive tickets” to youth who are seen obeying the rules of the road. The penalty? A free ice cream cone from McDonalds. This is the first time that Delta Police have used positive ticketing. The goal, Dubord said, is to reinforce positive behaviour and present the department in a different light. “No one likes to get a ticket. However, a positive ticket allows police to be seen as supporting good safety and social norms,” Dubord said. Dubord said the Delta Police, the community and corporate businesses have all worked hard in contributing towards children’s safety and making Delta a safer place to live. “We are very proud of our relationship with the community of Delta. This initiative would not work in every community,” Dubord said. The Delta Police want to remind drivers that a 30 km/h speed limit is in effect in school zones from 8:00 a.m. to 5:00 p.m. on school days and from dawn until dusk seven days a week in signposted playground zones. Officers will be focusing on speed in school and play- ground zones, seatbelts, yielding to pedestrians and school buses, and other motor vehicle act offences. Fines for speeding in school or playground zones can range from $196-$253 depending on the speed, and come with three penalty points. To keep up to date with the Delta Police and find out at which schools they will be handing out positive tickets, check their website (deltapd.ca) and social media accounts (@deltapolice). • If in doubt, SLOW DOWN in any areas frequented by children! • If your child cycles to school, ensure they know the rules of the road and are wearing an approved helmet. Ensure their bicycle is properly equipped with lights and reflectors and is in good working order.